It reminds me of the Dole plantation story. Apparently, Dole would create a lot of juice while canning pineapples, and then just throw the juice into the ocean. Someone had the wit to say, "er, could I have that?" Mixed drinks and the International House of Pancakes would never be the same. These numbers were being tossed into the ocean, as it were. Someone (Bob Winkenbach, to be precise) said, "could I have those numbers?" and he turned one real league into a virtual league…and an industry worth $800 million. Fantasy football fractures league play into individual player stats and these are welded into new bundles to be "owned" and managed by the sports fan. It is a little like an exercise in string theory. It asks what if these 30 players played not for their respective teams but together on one of these limitless Fantasy teams. There are many, many thousands of teams in Fantasy football. There are many alternate realities there. We are effectively testing the alternate Sundays of a Randy Moss or a Brett Favre. This is how ferociously inventive our culture is. We can recycle the "waste products" of existing cultural productions into the stuff of entirely new cultural productions. (Thus did Eugene Pack and Dayle Reyfel make theater out of people reading the autobiographies of celebrities.) We know practice a kind of cultural alchemy, creating one thing from another, and extracting new value in the process. We know that this is driven by a deeper culture trend, our wish, in this case, not merely to be passive sports fan but actually to act as owners and managers. Ours is an expansionary individualism. Now province of experience can be denied us. Nothing we find curious or engaging anyhow. And we get the usual tensions as noted in the Fringe post of a couple of days ago. Fans now find themselves torn between rooting for Favre as a Viking and against him because he is owned by a Fantasy league competitor. It’s astounding that Winkenbach thought of Fantasy football. To fracture one reality and to build many other realities out of the pieces. Genius, really. Bulmash, Greg. 2010. Fantasy Sports: The original social network. A Powerpoint deck on Slideshare. Aug. 19. http://www.slideshare.net/mobile/rtc123/fantasy-sports-the-original-social-network. Shontell, Alyson. 2010. “Fantasy Football Is An $800 Million Industry, But Who’s Profiting?.” Business Insider. http://www.businessinsider.com/fantasy-football-is-an-800-million-industry-but-whos-profiting-2010-9 (Accessed October 18, 2010). This entry was posted in Uncategorized and tagged Bob Winkenbach, Brett Favre, cultural alchemy, cultural recycling, ESPN, expansionary individualism, Fantasy Football, Greg Bulmash, Randy Moss, sports fan on October 18, 2010 by Grant. 1. This book is tremor material. It begins with a repudiation. Wasn’t I proud of all we [Gilbert and husband had] accomplished–the prestigious home in the Hudson Valley, the apartment in Manhattan, the eight phone lines, the friends and the picnics and the parties, the weekends spent roaming the aisles of some box-shaped superstore of our choice, buying ever more appliances on credit? I had actively participated in every moment of the creation of this life–so why did I feel like none of it resembled me? Why did I feel so overwhelmed with duty, tired of being the primary breadwinner and the housekeeper, and the social coordinator and the dog walker and the wife and the soon-to-be mother, and — somewhere in my stolen moments–a writer…? This is a thoroughgoing "no" to the consumer society, and I couldn’t help wondering whether we shouldn’t read the immense popularity of Eat, Pray, Love as an indicator of seditious thoughts and impending realities. No one is very keen on revolution in a downturn, but come the return to prosperity, it’s just possible we will have fewer takers than usual. We may be looking at what Mohamed El-Erian, a prince of the investment markets, calls the "new normal," a time in which people swear off material goods. I’m on record as arguing that there will be no enduring new normal, but Gilbert’s book gave me pause, as tremors will. But Gilbert is saying "no" to more than the consumer society. She is actually saying "no" to husbands, babies and suburbs, and "yes" to a spiritual quest. And if this is what speaks to 4 million readers, then we are could be on the verge of cultural revolution that resembles in the late 60s or the early 90s. Wow! In our culture, many things are possible. So the anthropologist (and fellow traveller) must keep track of everything happening at the moment AND all the alternatives this present will smuggle as stow-aways into the future. At the moment, it feels like we live in a relatively orthodox cultural moment, but then the present always has this "home field" advantage. 2. Gilbert, a creature of her time. Gilbert’s quest feels to me a little like the traditional mission of the avant-garde artist. She is keen to discover her real self, the one concealed by a middle class commitment to husbands, babies and suburbs. But it’s not long before we see that she is also a postmodernist. For she is searching not for a single self, but for several of them. 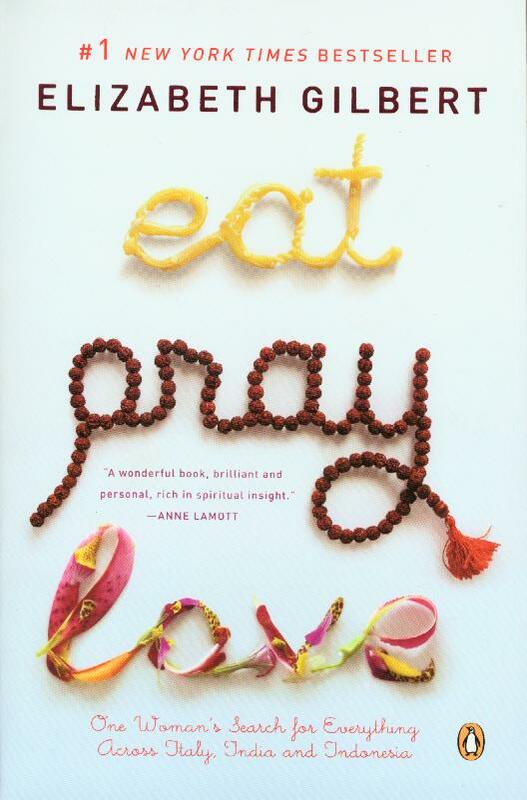 This is a book about eating, praying AND loving. Gilbert seeks her self in Italy, India AND Indonesia. Gilbert is tempted along the way to cultivate one of these existential modalities. But no. She refuses to choose. The great Sufi poet and philosopher Rumi once advised his students to write down the three things they most wanted in life. If any item on the list clashes with any other item, Rumi warned, you are destined for unhappiness. Better to live a life of single-pointed focus, he taught. … What if you could somehow create an expansive enough life that you could synchronize seemingly incongruous opposites into a worldview that excludes nothing. … I wanted worldly enjoyment and divine transcendence–the dual glories of a human life. This is the postmodern voice. When told that one ‘life choice,’ one ‘self choice,’ must cost us the other, the postmodernist says, "I refuse to choose. I will have them all." Thus when Elvis Mitchell asked Steven Soderbergh how he prepared for the movie Out of Sight, the director said he said to himself, "If you blow this, you will be doing art-house movies for the rest of your life and that’s as bad as doing big budget things. I wanted to do both." Choosing between art house and big budget, this was the cross on which filmmakers of a previous generation had crucified themselves. Because in those days you had to choose. Not Soderbergh, and not Gilbert. Not any of us. Postmodernists don’t. 3. Gilbert, perhaps an architect of her time? Understanding Steven Soderbergh and people like him was the mission of a book I published a couple of years ago called Transformations: constructing identity in contemporary culture. My anthropological mission was to figure out how to describe a culture in which people claimed this kind of latitude and liberty for themselves. This book ends with my account of something I call "expansionary individualism." This is too grand a term, to be sure. It came to me while sitting in Central Park beside the reflecting pool. Some guy was sending a small wooden sailing ship out across the water, and just as it was about to crash into the concrete lip of the pool, he would catch it and push it out again. And I thought to myself, "Hey, c’est moi. My life in a nut shell (and reflecting pool). Journeys don’t end neatly. Moments before disaster, I just push off again." Perfect. Postmodernism would have to result, I supposed, in disorder, multiciplity in mess. But that’s not how Gilbert sees it. Her mission was a quest not just for many selves but for a harmony between them. Hey, presto. Artist to the rescue. No sooner have we invented a culture of commotion than an artist steps up and suggests a way we might return to order. That is, I guess, what we pay them for. McCracken, Grant. 2008. Transformations: Identity Construction in Contemporary Culture. Indiana University Press. I can’t find the source for the Soderbergh / Mitchell quote. This entry was posted in Uncategorized and tagged Christopher Nolan, Eat Pray Love, Elizabeth Gilbert, Elvis Mitchell, expansionary individualism, Memento, Motoko Rich, new normal, Out of Sight, postmodernism, postmodernist, Steven Soderbergh, The Usual Suspects, Transformations on August 3, 2010 by Grant.